Long sleeved cardigan: 41-46cm 2 balls, 51-56cm 3 balls, 61-66cm 4 balls. Short-sleeved cardigan: 41cm 1 ball, 46-61cm 2 balls, 66cm 3 balls. 50g balls Sirdar Baby Speckle, 60% cotton/ acrylic DK (main photo shows shade 122). DK tension 22st/ 28 rows to 10cm, 4mm needles. 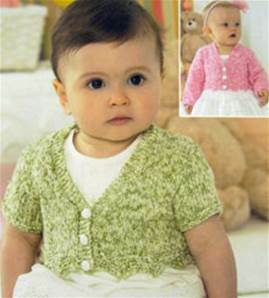 Also suitable for Sirdar Snuggly DK, Tiny Tots, Baby Bamboo, Baby Crofter or other baby DK - amount may vary. 3.25 and 4mm needles, st holders. 41-51cm 3 buttons, 56-66cm 4 buttons.